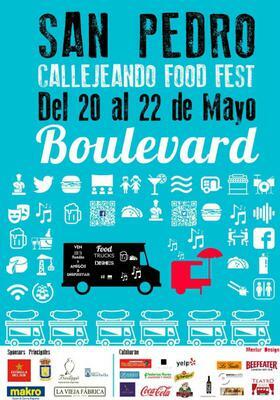 Boulevard San Pedro Alcantara host a Strolling Food Fest, a culinary event that will be attended by 11 trucks of food from different countries, confirmed today, although the organization expects thirteen. It is an explosion of culinary and artistic creativity, with haute cuisine in informal formats, at very low prices to offer a new way of living to feel the urban environment and enjoy artiststs, theatre productions, live music and painting. In addition, attendees can enjoy an outdoor Cooking Show with the presence of Michelin star Chef Diego River and local chefs. There will be a Zinder area where children can be dropped off and play. On Saturday 21st May we visit the food festival with high expectations that we would discover some international food suppliers or an eatery that would tempt us to partake in some of their food. Well there was a goats cheese vender from Caseras who we have known for years, and very good he is, a Goats cheese & Jamones Ibericos supplier where we bought some cheeses and a Black Pudding, and a Bread shop (originally unattended). For the rest there were 3 mobile eateries, One cooking pork ribs with brochettes of bar-b-cued vegetables, another with 14 alternative creps, and a third that was an Argentine Grill. For the rest, there were 4 bars, a theatrical coaching stand, and a ladies garment trailer. Hardly the 11 international Haut cuisine Dining experiences that was promised. No sign of the culinary and artistic creations from Michlin chef Diego River, or any live music and theatre, but perhaps these only happen in the evening! I wonder how many others were as disappointed as us with the misrepresentation of this event, and will not bother to return next year. Is this what SPIN is all about? We revisit the festival again on Sunday and find the bread stand working hard and a further 3 mobile foodie vehicles plus Helicopteros Sanitarios recruiters, but that was it!